A weight should be chosen that the patient can only lift 15 times. Each exercise should be repeated up to 15 times (or a smaller number of reps if required) followed by rest. Try to limit the rest period between each set of repetitions to one minute. It may help to instruct the patient to move their arms up as they breathe in and down as they breathe out. However, if they find this difficult then just emphasise that the most important point is not to hold their breath. It is generally recommended to perform the exercises in the in the sitting position with back supported. However, in everyday life upper limb activities are often carried out in standing. Some of the exercises can be performed in standing providing the patient can perform a correct technique. Examples of unsupported arm exercises are shown below. Arm exercises should not cause significant discomfort to the shoulders. Check with the patient about any shoulder problems before commencing arm training and modify the range of movement if necessary. Cease arm exercises if shoulder discomfort or pain persists. Hold a bar with hands at knee height. Lift bar above head, then lower. Breathe in while lifting bar up and out while lowering bar down. Start with arms by your sides. Lift your arms until they are at shoulder height (breathe in while you do this). Move arms forwards to meet in the middle, keeping elbows straight (breathe out while you do this). Reverse the movement until the arms are horizontal at shoulder height (breathe in while you do this). Return arms to your side again (breathe out while you do this). Ellis, B. P. T. & Ries, A. L., 1991. Upper Extremity Exercise Training in Pulmonary Rehabilitaiton. Journal of Cardiopulmonary Rehabiliation and Prevention, July, 11(4), pp. 227-231. 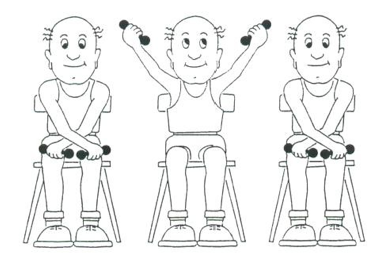 These exercises are to be performed whilst seated in a chair with back support. Sit with your feet flat on the floor, and the small of your back pressed back into the chair. Your elbows must not be locked. All arm movements should be performed on exhalation (breathing out). Each exercise is to be performed 10 times. Rest for 1 minute. This forms one set. Build up to 3 sets. When you can perform 3 sets for two weeks, increase your weight by 0.5kg. Arms crossed in the lap, elbows straight and palms facing down. Arms down by side, elbows straight, and palms facing backwards. Lift arms up, out and apart until they are extended above the head with palms facing backwards. Arms down by sides, elbows straight and palms facing backwards. Arms are lifted up and out to the side (horizontal) while rotating hands to finish with the palms facing forward. Arms are moved forward to meet in the middle. From22: Ellis, B. P. T. & Ries, A. L., 1991. Upper Extremity Exercise Training in Pulmonary Rehabilitaiton. Journal of Cardiopulmonary Rehabiliation and Prevention, July, 11(4), pp. 227-231.